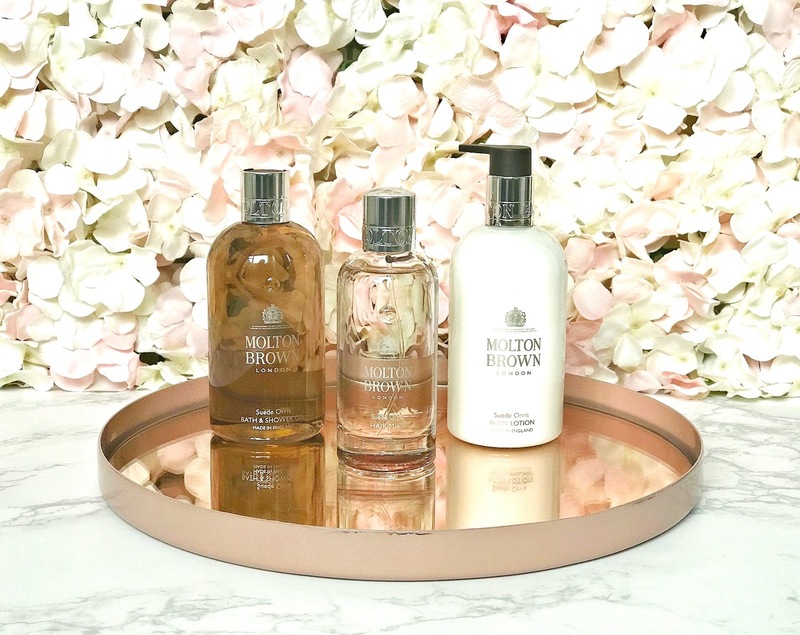 Regular readers will know that I'm a massive Molton Brown fan so I was over the moon when their latest collection landed on my doorstep. The Suede Orris range consists of four products - a bath & shower gel, body lotion, eau de toilette and hair mist. Layering products ensures that the scent lasts longer on the skin but the addition of a hair mist means the scent will linger from head to toe. Both suede and orris were commonly used in the 16th century but the perfumer created a modern twist on an old combination. Combining top notes of mandarin, olibanum and elemi, middle notes of Tuscan orris, rose and jasmine with base notes of cedarwood, labdanum and patchouli, this fragrance is both fresh and warm. It's also soft, powdery, feminine and sensual. It isn't overpowering because it's so soft and it really is an understated, elegant and luxurious scent. I think it's perfect for all occasions - work, date night and I really think it would work well as a wedding fragrance. Bath & Shower Gel: I love that the shower gel is soft pink in colour as it depicts the soft, creamy scent of the product. As with all Molton Brown shower gels, this fills the bathroom with fragrance, lathers well and rinses easily without stripping or drying the skin. I also love that a little goes a long way with it and because the bottle contains 300ml, it should last a few months. Body Lotion: I love using matching shower gels and body lotions as I feel that they really lock the fragrance in and this is no exception. I find that this body lotion spreads easily and absorbs quickly as long as I don't apply too much. If I pump too much out, it takes a little longer to absorb and a bit more effort so the key is to use small amounts and you're good to go. This really nourishes the skin and doesn't leave a tacky feeling. I also find that it really does extend the wear time of the fragrance and it lingers on my clothes/pyjamas! Like the shower gel, this is a 300ml bottle and a little goes a long way. Hair Mist: I was really excited to see this addition to the line! I have used this directly on my hair and also by spraying in front of me and walking into the veil of fragrance - either way works fine. I love that my hair smells really fresh and clean and that with movement, it refreshes the scent. Because the fragrance is subtle, I can use the mist with the other products without the risk of it being overpowering (for me or those around me!). This is a decadent treat - ideal for Mother's Day? I also think it would work beautifully for a bride as her scent will linger in the air with all of the products layered and the EDT worn too. There is also an Eau De Toilette, which is available in both 50 and 100ml bottles and some beautiful gift sets, which would make perfect Mother's Day gifts, each of which offers a saving of over £10! Have you used a hair mist to match your fragrance before? I'd love to hear! Don't forget to enter my Erborian Gift Set giveaway here! All products are bought by me, unless otherwise stated. These products were kindly sent to me. Opinion is always my own. Affiliate links may be used. 3 treats for 3 budgets! Caudalie Resveratrol Lift - limited edition size!